A head of hair is just a few steps away. Using Vibrantz® could not be simpler. Apply it in minutes, style it as you wish, then remove easily with a shampoo wash before bed. First, style your hair as normal. 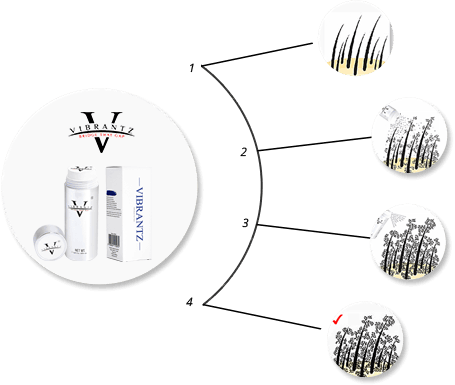 Lightly sprinkle Vibrantz® Hair Fibres onto the areas of hair where you require thicker hair or more volume is needed. 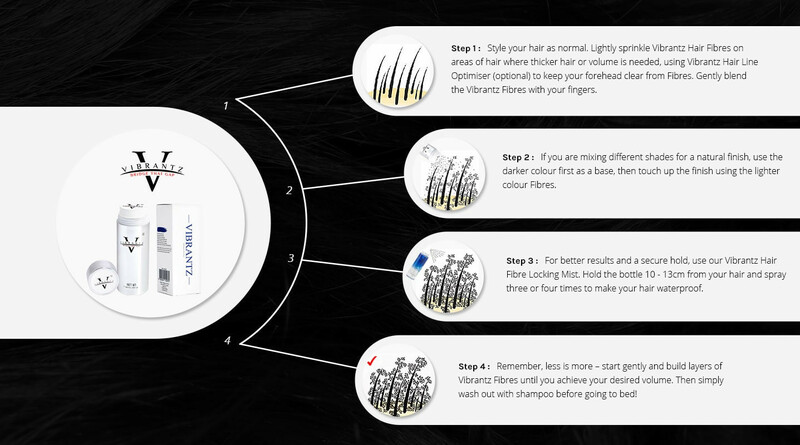 Gently blend the Vibrantz®Fibres into your hair using with your fingers. If you are mixing different shades together for a natural finish, use the darker colour first as a base then touch up the finish using the lighter colour fibres. Remember, less is more – start gently and build layers of Vibrantz®Fibres until you achieve your desired volume. After a successful day with your beautiful thick head of hair, simply wash out with shampoo before bed. If you’d like a visual guide to applying your hair, as well as to see some of the great results that are possible, just check out our range of tutorial videos. When you choose Vibrantz®, you are not only choosing the industry’s leading solution but its widest range of expertly designed application hardware. We’ve found that the industry lacks so much when it comes to application products, so we’ve changed the game. Use after application of your fibres as a mousse to ensure fibres remain even longer and stronger. Recommended for long days out in the elements! Attach to your hair fibre bottle to more accurately apply your fibres to desired areas of the head. Perfect for achieving the best volume possible! Hold along the hair line to ensure that your fibres do not fall on your brow. Excellent when in a hurry!